Some members of the FNCV Fungi Group. 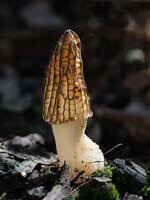 The Kingdom of Fungi is often referred to as the 'Forgotten Flora' or 'The Hidden Kingdom'. These terms greatly undervalue the important role fungi play in our environment. Imagine a world void of fungi. In such a world fallen trees, dead leaves, animal carcasses and all other spent waste organic matter would litter the planet. 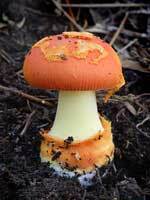 Thanks to the invisible activity of fungi, with some aid from other decomposers, all this waste material is recycled. 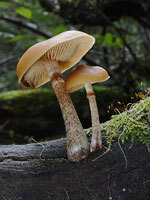 Fungi also form important symbiotic relationships with most plants and some animals, without which their competitive advantage would be greatly reduced. Meetings are held on the first Monday of the month. We discuss ways of identifying various species of fungi, and we also have guest speakers presenting their latest work in the field of mycology. We conduct forays at various locations within easy driving distance from Melbourne. The forays are attended by people of various ages and experience, and each foray is led by an experienced guide. After each foray, we review, identify and document what we have found. We produce two e-books, Fungi In Australia and A Little Book of Corals, which feature some of the fungi found during our forays, and can be used as field guides. These e-books can be freely downloaded. On most of our forays we make fungal collections for the National Herbarium, Royal Botanic Gardens Melbourne, with which we have a close relationship. Our foray species lists are sent to Fungimap Inc., which is undertaking the important task of documenting and mapping Australia's fungal biota. 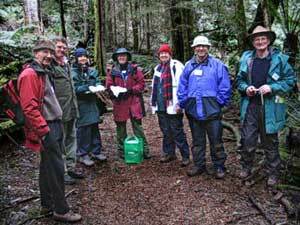 The Field Naturalists Club of Victoria promotes the conservation of our environment. Picking mushrooms for consumption, on whatever scale, does not fit in with this goal and is not permitted during any of our forays. Limited picking for study, educative purposes, and the collection of herbarium voucher specimens is permitted under our present permit. In general this should be performed as inconspicuously as possible, without visible damage to the surroundings.